Why do machines fail? 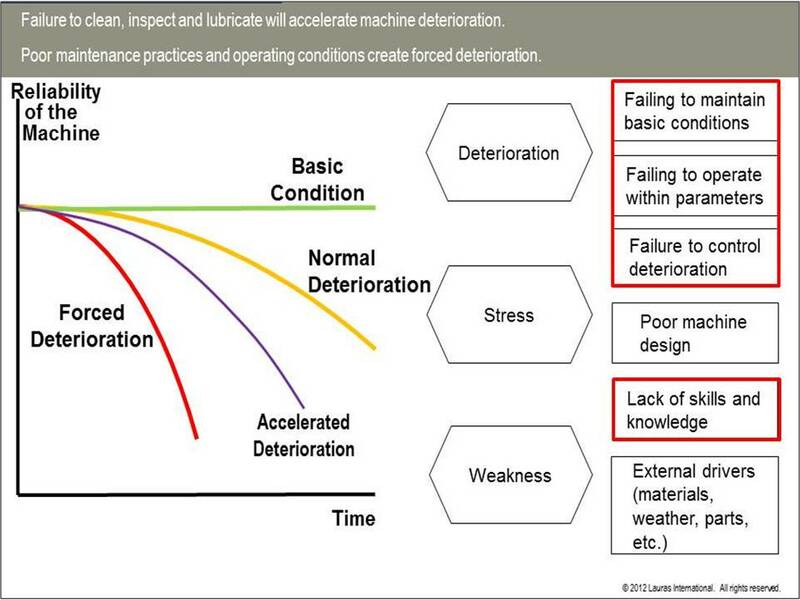 Deterioration, stress and weakness are the main factors in machine failure. When we buy a brand new car we invariably read the manual to get an understanding of the basic maintenance requirements. The car will be washed on a regular basis, tyres and oil checked, etc. When we drive the car, we don’t travel at 90mph in second gear, we drive the car within its capabilities. We’ve spent a large amount of money on the new car, so it would be foolish not to look after it, wouldn’t it? So why don’t we look after the machinery in our work place like this? Invariably we see key pieces of plant within our factories in a poorly maintained condition, constantly breaking down or causing quality defects with operators who know very little about the machine. To replace the machinery will cost a considerable sum of money and unless we change the way we look after the machinery it will probably need replacing again within 7 to 10 years. A never ending cycle of abuse and cost, that needs to be broken. Lauras International has a four step approach to Asset Care using a combined operator and maintenance strategy. Through working with engineers on an Asset Care project operators increase their mechanical ability and start to take ownership for their machines. They are able to perform simple maintenance tasks such as changing wear parts and basic lubrication. The engineering team are then freed up to perform pro-active rather than reactive duties. At the same time operators learn more about the detail of the way machines work from the maintenance team enabling them to start to spot the early stages of problems, that if not properly dealt with would become a major problem in the future. Contact us to find out more about how we can help you care for your assets. This entry was posted in Lauras International, Reliable Maintenance, Top Tips, TPM on July 15, 2014 by beajames.